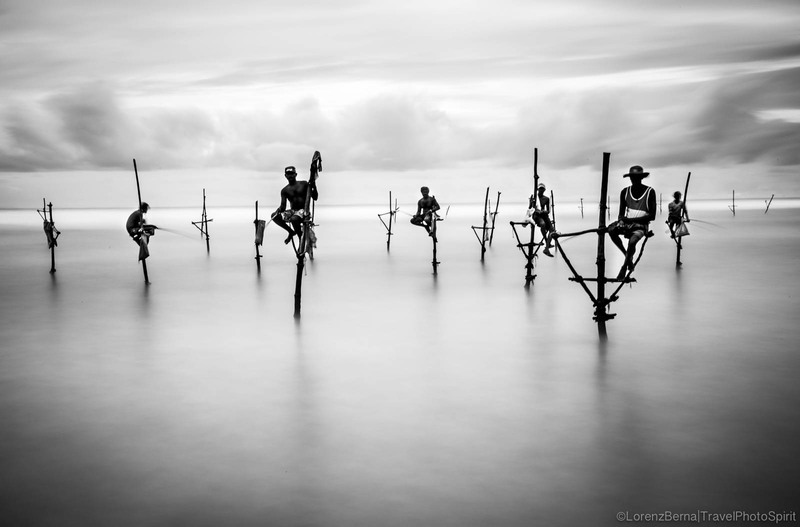 Stilt Fishermen in Weligama, Sri Lanka. Weligama is a little coastal town in south-west of Sri Lanka. Together with Unawatuna, it’s one of the best places in Sri Lanka to watch the last traditional stilt fishermen in action. As many of us might already know, this brave and particular way of fishing has been made famous worldwide by the iconic pictures of Steve Mc Curry in 1995. Unfortunately for the villagers, the tsunami of 2004 destroyed most of the reef so this part of the coast is not anymore an ideal habitat for the fish. It is therefore quite difficult now, to see large groups of men fishing together, and especially real fishermen. Today, we mostly see men posing on stilt, waiting for the tourists to take the picture in exchange of a remuneration. Thanks to our local friend Asank who knows well when the tie brings more fish near the beach, I’ve been able to shoot these pictures. To get different and original angles on a sort of “cliche” scene is not an easy task. With the help of a tripod, low iso and a neutral density filter, I wanted to melt water and sky together in order to create intriguing and dream-like pictures. Sometimes it is nice to break the rules and give space to imagination.